I hope you are having a great week. 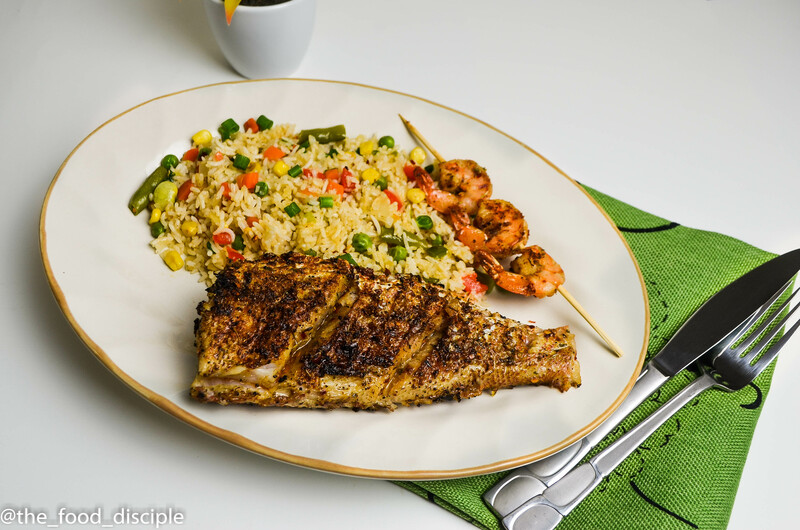 Today’s recipe is my delicious, well seasoned grilled red snapper fish. 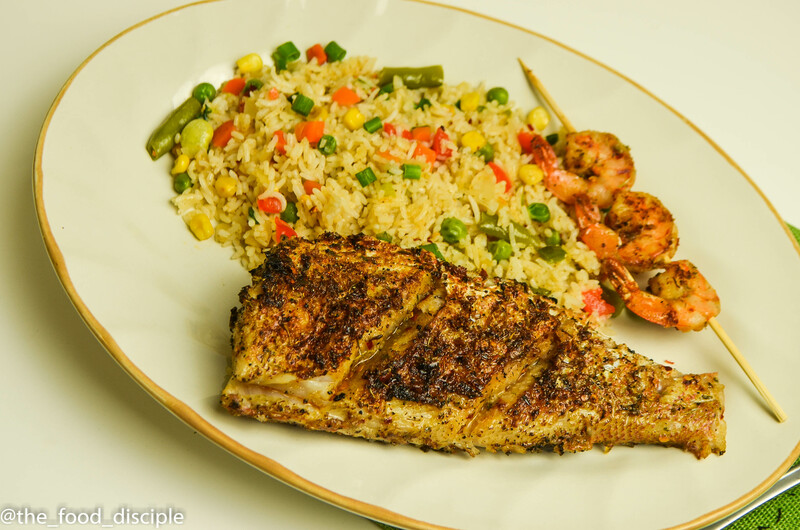 Red Snapper is one of my favorite fish and it was a no-brainer when I wanted to cook something nice for my mum. She has been visiting for a few weeks now and I have not had the chance to treat her to something nice. This was paired with a delicious plate of Vegetable fried rice (Indian style) which I will share soon on the blog. I had a little Indian flavor going on with the seasoning and it was a match made in heaven; just perfect I promise you. I added some shrimp to the mix because I lovvveee seafood and I could not just have fish on my plate alone and adding shrimps to the mix just took the dish to another level. I used the same marinade for the fish to marinate my shrimp. Preparation is very easy to follow and the ingredients are easily sourced and very affordable. You can have a luxury meal in your own home without having to break your bank. Step 1 Clean fish and pat dry with paper towel. Step 2 Mix all ingredients except butter in a small bowl to create marinade. Add salt according to preference. Step 3 Place fish in a zip lock bag or a bowl, apply marinade and properly coat fish. Tightly seal zip lock bag making sure there is no air in bag. If using a bowl tightly seal with a plastic wrap. Place in fridge and marinate for at least 4 hours or overnight. Step 4 Place grill pan on medium heat. When hot, using a brush lightly grease grill pan with butter and 1 tbsp of olive oil. Step 5 Place fish on grill on both sides for 5-6 mins each. Do not turn fish for about 5 mins so the fish does not stick to the pan. 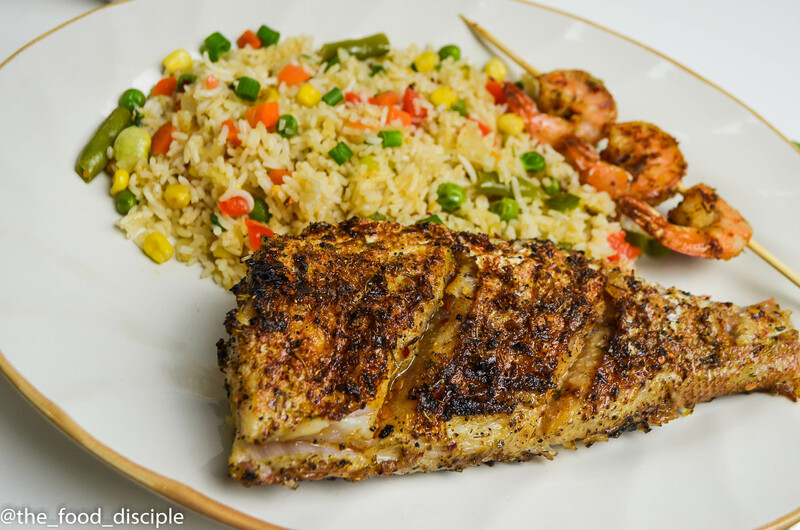 Use kitchen tongs or spatula to flip the fish. Cooking should take about 12 to 15 mins. Carefully turn fish so it does not pull apart as the fish is very delicate. Cook until fish is charred and well done. Please send me recipes of Fish. We recently moved to the the southcoast of KwaZulu-Natal, South Africa and lots of fish markets and learning to catch our own.